We think of dolphins as playful — but they may also be more cunning than we ever realized. 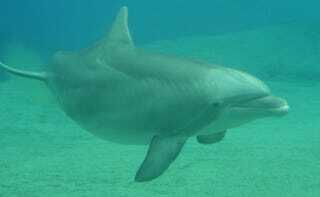 A subset of the dolphin population in Laguna, Brazil has started cooperating with human fishing expeditions. The dolphins will help people get better catches, in return for whatever the fisherman discard. They'll drive schools of mullet towards the fisherman, and they even signal when and where to cast the nets. Newly published research has looked at the dolphins who are helping out in this unique way. What the scientists discovered is that the sea mammals that cooperated with the humans were more social than the ones that didn't, both within their own species, and with ours. The researchers believe this is to do with social learning practices, where these skills can be passed between the more connected dolphins. What's intriguing to me is how close this skirts to the origins of domestication. By cooperating with these select dolphins, we're feeding them more, and giving them potentially a better chance at survival, and passing on the cooperative skills. Tell me that doesn't sound like the first stages of what happened with dogs? Now we just need a few thousand years to breed them into the dolphin equivalent of a lapdog.